Fishing has been our family’s passion as well as livelihood, for generations. 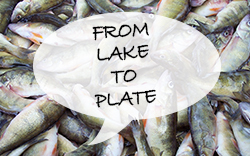 From this unique heritage, come many heirloom recipes for preparing and serving our favourite freshwater fish dishes. 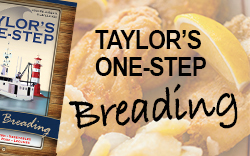 Taylor’s One-Step Breading is the result of our search for the perfect coating that is quick and easy to use. This savoury blend of herbs and spices provides a light, delicate coating that complements the flavour of any dish. With this simple, one-step process there is no need for a milk or egg wash. Just coat and cook. It’s excellent for frying or baking. Use it for gravies too! 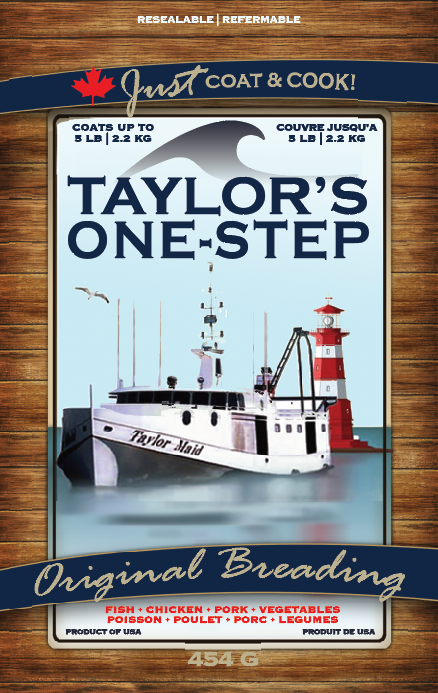 Now with a new look, try Taylor’s One-Step breading on your fish, chicken, pork or vegetables. You’ll love it on everything! It is available to everyone for the low price of $7.99/bag. It’s the same great recipe, in a new bag! Shake bag well before use. Rinse your fish, apply your breading and then wait. The trick is to allow the fish juices to fully moisten the breading before cooking. Resist the temptation to add more breading, it will be perfect. If you are unable to purchase your breading at one of the locations listed above we will gladly ship our breading straight to your front door. Please contact us for postal and delivery charges. 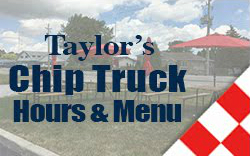 2018 Taylor Fish Company. All rights reserved.